Hey there, everyone! Welcome to day two of the July Lawn Fawn inspiration week! Today we are showcasing the alphabet set called "Quinn's ABCs". This set is a larger outlined alpha in a really cute font! It has so many fun possibilities! I used Chupa's Sketchbook Saturday Challenge #19 to help with the design of my card...she create the greatest sketches. You should really try them out if you haven't already!! I also used this Pink Paislee collection that I won off the Moxie Fab blog last summer...and have never used any of it! Which is a shame...because I really love the color combo and the fun patterns in the paper. So, at last I have cut into it!! Instructions: Make card from red cardstock. Cut blue patterned paper slightly smaller, and adhere to the front. 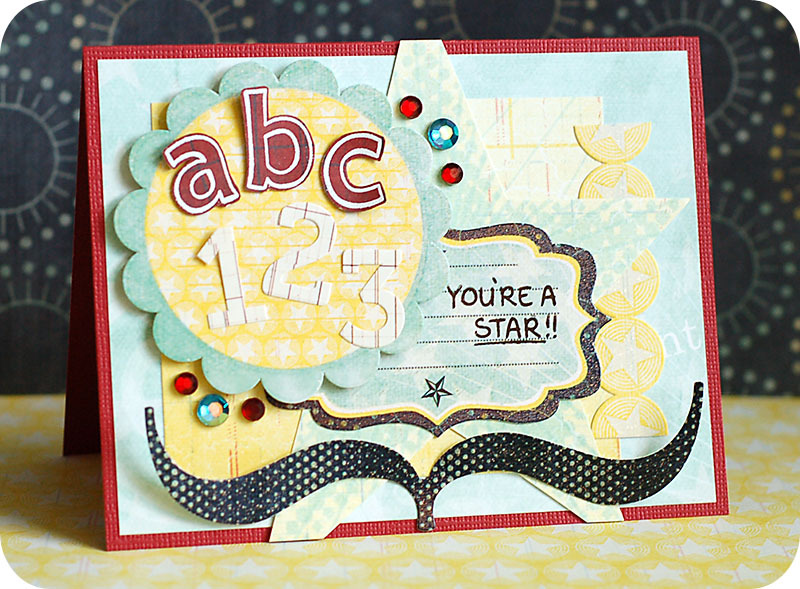 Cut yellow paper block, adhere to the front, and add a circle star sticker to the right paper edge. Cut the star from patterned paper, adhere to the front, and trim off the excess. Stamp the "You're A Star" sentiment to a label sticker, and adhere to the front. Stamp and heat emboss the letters to red patterned paper, cut out, and adhere to the top of a scalloped circle sticker. Add the number stickers below them, and then adhere the entire scalloped circle to the front with foam adhesive. Add a bracket sticker to the bottom of the card, then accent with jewels to finish. I think this card would be really great for all the different achievement levels that kids hit in school. It would certainly be great for those who are getting straight A's and and successfully flying through the schooling process. But, I think it is even more fitting for those kids who are trying SO hard, and still pulling B's and C's. Academics doesn't come easy for many, and I think letting them know that they are a star for trying their best is super important. love the layers on your card! Wonderful colour scheme and design - and awesome stamps! Love the color scheme and lots of beautiful details. Awesome card Lea!